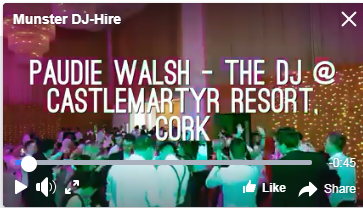 Paudie Walsh is one of the best wedding DJ in Cork and plays countless weddings in the city and county each year. One amazing venue on the edge of Cork City is Castlemartyr Resort. It is a 5 star luxury resort just 20 mins from the city center. The resort sits on over 200 acres of mature landscape and gardens. As well as the hotel there is an award winning restaurant, spa and an 18 hole golf course. This place shouts luxury. Just take a look at their website for a few pictures. It is amazing. I have played many weddings here over the years and it is always a brilliant night. It is a nice size function room with a capacity for 220 guests. What I love about this room are the floor to ceiling windows. It is makes the room feel so much bigger and on a nice day it allows lots of light in. It is also pretty cool at night as it is like you are playing outside, under the stars. For this wedding the couple had chose to have a wedding band on first. Check out my recommendations page for some fantastic wedding bands. On this particular night the band were Cork based and had setup in the early afternoon as the stage was in place and there was room for them to do so. This meant that the there was little delay between the meal finishing and the first dance. I arrived just as the meal was coming to a close and once the space had been made with the tables I loaded into the function room and setup. I was ready to start just before the first dance. The band a lively 2 hour set with a short break in the middle to tea/coffee/evening food. Once the finished at midnight I started straight away. There was no delay between the band finishing and me starting. This was great as the dance floor was full and I was able to keep everyone there. There was also no loss in atmosphere in the function room. I played a mix set of up tempo songs. The demographic and age of the wedding party meant that the 90’s dance and chart music went down very well. Guests were requesting songs from Rihanna/Nicki Minaj and David Guetta. I was able to work all of them in during my set. Take a look at my playlist section which gives you an idea of song suggestions for a wedding DJ. For the end of the night, the wedding couple had asked me to finish on Take That – Never Forget. It is an absolutely great song to finish the night off on. As you can see from the video below I had all of their family and friends join them on the dance floor for it. It was a really nice way to finish off the night and on a high. People formed a circle around the Bride and Groom to sing the chorus for them. No better way to end the evening. Shouts for more and more were heard and credit to the guests I could have played all night for them. Lots of fun. Take a look at the video below for a few highlight clips from the night. If you would like to check availability and/or get a quote for your after band wedding DJ set in Castlemartyr or indeed anywhere in Cork don’t hesitate to get in contact. You will have one the best wedding DJ in Cork. Also feel free to pick p the phone for a no obligation chat about your big day!